In 10-inch skillet, cook bacon until crisp; drain on paper towels. Crumble; set aside. Reserve drippings. Spray 13x9-inch pan with cooking spray. In 2-quart saucepan, heat broth to boiling over high heat. Gradually stir in grits and salt. Reduce heat to low. Cover; simmer 5 to 7 minutes, stirring often, until grits are thickened. Stir in cheese and bacon. Spoon into pan. Cover; refrigerate 1 hour or until firm. Heat oven to 450°F. Run spatula around edge of pan and under grits to loosen edges; turn upside down onto large cutting board. Using 1 3/4-inch round cutter, cut grits into 30 rounds. Place in single layer on large cookie sheet. Bake 20 minutes; turn cakes over. Bake 10 to 12 minutes longer or until crisp and browned. Meanwhile, add shrimp and garlic to bacon drippings in skillet. Cook over medium heat 3 to 4 minutes, stirring frequently, until shrimp are pink. Stir in tomatoes. Reduce heat; simmer 1 minute. Remove from heat; cover to keep warm. 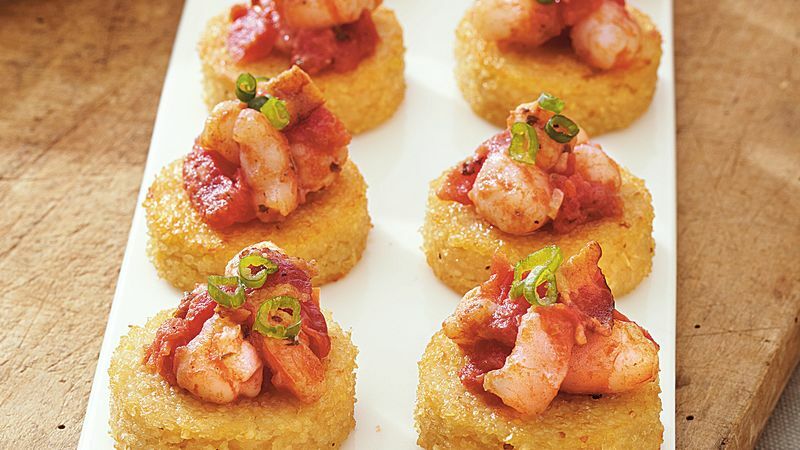 Top each grits cake with 1 heaping teaspoon shrimp mixture; sprinkle with onions.